This blog post is translation of an article published in marathi daily 'Loksatta' under column 'Ghatmathyavarun' on 29th March, 2017. While planning my expedition: Walking on the Edge, my wanderlust urged me to move beyond the Sahyadris and I decided that I would extend my expedition to the Satpura range. As a trekker I am well acquainted with the Sahyadris – the range, the peaks, the mountain pathways, the villages, the hamlets –are old friends now. But Satpura was new to me. Of course as the scope of the expedition extended, I and my team, we started looking for an appropriate starting point. And we found Bharad! Seemingly a mere name on Google earth, Bharad is situated on the banks of Narmada, where the borders of Maharashtra, Gujarat and Madhya Pradesh meet. Its location made it an ideal starting point for my expedition. Since none of us really knew, where this village actually was, we had to undertake another journey before the expedition: in search of Bharad. On the way to Bharad, you start ascending the Satpuras after Dara village. Satpuras – dry, barren, with almost no vegetation, but aflame with palas: the Flame of the forest, silent with no vehicles on the hilly roads except for the infrequent blue state transport bus and some jeeps, which carry 30-40 people clinging to each other on a single journey, – was as different from Sahyadris as chalk and cheese. The hilly mountainous roads make the villages and hamlets almost inaccessible and therefore leave them isolated and alone. Traversing these hilly roads, we finally reached our destination, a small village, inaccessible by road, far away from the madding crowd, with no electricity, no regular water supply, just a few solar lights. It is actually a hamlet surrounded by hills, comprising of just about 10-15 scattered bamboo huts, situated very close to the banks of Narmada. Due to the proximity of the river and the ferry service, villagers have an easier access to and travel to Kawath, a taluka place in Gujarat for their day to day supplies – right from vegetables to things like cupboards etc. The lack of transportation, the high costs and the travelling time, make it difficult for them, to come to Maharashtra. So though technically in Maharashtra, Bharad is better connected to Gujarat. This connection is reflected in various things for e.g. language – with us they do speak Marathi but with a definite Gujarati accent. Their communication is in their own dialects ( Bhilori and Pawri), which are totally incomprehensible to us. 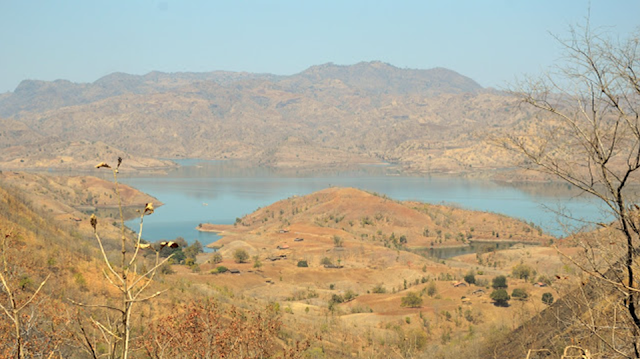 Being on the banks of Narmada and near the dam has forced a rehabilitation of the village once and the villagers may have to move again across the mountain to Chinchkhedi. However the proximity of the dam has not improved the living conditions here. Lack of irrigational facilities leave the villagers at the mercy of the rains. Selling mahua flowers, working on daily wages and monsoon farming are the only means of livelihood here. We reached Bharad as total strangers. But the villagers welcomed us with open arms. Their houses have walls of bamboo mesh, not plastered with mud and therefore welcome the sun and the wind. These houses gave us an equally warm welcome, offered us everything- food, shelter, warmth, help. The villagers were ready to guide me through the unknown Satpura and help me get acquainted with these mountains better. From here, with the friendship of these people, I have started my journey: Walking on the edge. To the north on my right are the Vindhyas, to the south the Satpuras and as I walk along the banks of Narmada I ask myself: How well would I get to know these mountains? I don’t know yet. But yes, I would love to know these people better, as pure, and as untouched as the mountains themselves.